country western music makes me cry. You are looking mighty prego and SUPER CUTE Lizzy!!! AAaaaaaaaaahhhhh!! I can't wait to see you in person!! You are adorable. Seeing this picture makes my heart ache for another (and my youngest is only 3 months old). My belly shape is JUST like that when I'm pregnant!! oh I just love pregnant bellies. I loved being pregnant. I didn't love the stretch marks, but I really did enjoy being pregnant. I hope you are too! Liz! It was so good to hear from you! How exciting you are pregnant too. Looks like you are a week ahead of me. Congrats on the boy. We are excited for our little man as well. I hope everything is going smoothly with your pregnancy. You look amazing! Seriously, you do. What a cute little baby bump! It is perfect. I'm getting excited to see this little guy as, I'm sure, are you! Miss you! i hope that when i'm pregnant i look as adorable as you do! Oh my gosh you're pregnant, you really are pregnant!!!!! I can't believe my stomach is going to stretch like that in just a matter of weeks. It's hard to fathom. You are so cute. Wish I could be there with you. Email me your address. I have some things for this new little guy. ashgav@msn.com. Hang in there! love those bellies at the end. well, not when my belly is big and uncomfortable, but love seeing other people looking so cute;-) i look at the pics of me on my due date with my first and i think, i wasn't that big....but then i remember feeling SO uncomfortable. hopefully you're not feeling too uncomfortable. Oh Elizabeth! You look too adorable! Yipee, and a soon to be congrats!! You are looking Oh so darling! Your ocean shower looked like it should be featured in a baby magazine! How fun! Hey Liz! I am so excited for you! I want you to be able to see my blog, its not that great....like yours or NieNie's but I still would like you to visit every now and then. :o) Its private so you need my email....harroldfam at google dot com. Just send me a not and Ill be able to get your email and give you permission! Oh and you look A-MAZ-ING pregnant!!!! good luck! You look sooooo good! 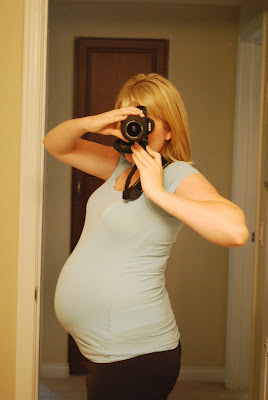 I've been wanting to do one of the baby bump pics, but right now I just look like I've gained weight! ha ha!